CULVER CITY, Calif. (Nov. 3, 2014) – Golden Globe® winner Idris Elba (Best Actor in a Mini-Series, TV’s “Luther”, 2012) and Academy Award® nominee Taraji P. Henson (Best Supporting Actress, The Curious Case of Benjamin Button, 2008) headline the hair-raising thriller NO GOOD DEED, coming to Blu-ray™, DVD and Digital HD on Jan. 6 from Sony Pictures Home Entertainment. Terri (Henson), a former lawyer and devoted wife and mother of two, offers to help charming stranger Colin (Elba) after he shows up at her door claiming car trouble. Terri soon learns that no good deed goes unpunished after Colin’s real motive is revealed and she finds herself fighting for her family’s survival. NO GOOD DEED also stars Leslie Bibb (Iron Man). “Making a Thriller” Featurette - Producers Glenn S. Gainor and Will Packer, as well as Director Sam Miller, Idris Elba and Taraji P. Henson discuss the process of making a thriller, developing relatable characters, and incorporating exciting action while telling a real and raw story. · “The Thrill of a Good Fight” - Taraji P. Henson and Idris Elba discuss the intense physicality of the fight sequences and what goes into creating a thrilling fight. · “Good Samaritan” - Taraji P. Henson and filmmakers discuss Terri's decision to help a stranger during the night. Terri (Taraji P. Henson) is a devoted wife and mother of two, living an ideal suburban life in Atlanta when Colin (Idris Elba), a charming but dangerous escaped convict, shows up at her door claiming car trouble. Terri offers her phone to help him but soon learns that no good deed goes unpunished as she finds herself fighting for survival when he invades her home and terrorizes her family. The film is directed by Sam Miller from a screenplay by Aimee Lagos. Executive producers include Idris Elba, Glenn S. Gainor, Ellen Goldsmith-Vein, Rob Hardy, Taraji P. Henson, Aimee Lagos and Lindsay Williams. Lee Clay and Will Packer serve as producers. 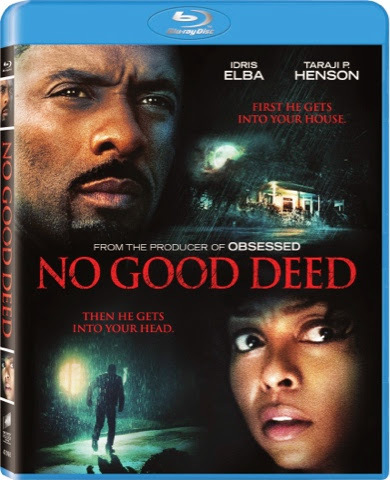 NO GOOD DEED has a run time of approximately 84 minutes and is rated PG-13 for sequences of violence, menace, terror, and for language. Academy Award® is the registered trademark & service mark of the Academy of Motion Picture Arts & Sciences.